Isometric Training for Martial Arts is a specialised section here on Isometric-Training.com dedicated to answering questions on how Isometrics can be applied to the Martial Arts and thus substantially improving the vital components of Strength, Speed, Power, Endurance, Weight Loss, Injury Recovery, Forearm Development and More. Isometric Training for Martial Arts has long been a hidden gem of many traditional styles such as Kung Fu, Karate (particularly Kata’s such as Senshin). Subtly applied in the traditional training forms it is isometrics that has been the key to the development of the astounding power of many of the great martial arts masters, not to mention their lighting fast reflexes, speed, agility and staggering feats of strength, such as having boards, bars and sticks smashed across their bodies without harm. Just take a look at the development of Kanazawa Sensei opposite. The following Articles discuss each of these points in detail and reveal some of the key principals of why Isometrics are so effective in the development of the martial artist. In fact, my first introduction to isometrics, physical culture and fitness was with the martial arts. I was introduced to Shotokan Karate, a style of Japanese Karate characterised by its deep stances and powerful hip and leg movements in my early teens. 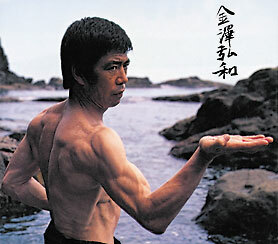 My sensei continually emphasized that the power in our punches would be generated by our legs and our hips. I owe a great deal of my strength to those early days when I spent hours training and maintaining deep stances and then springing into action with devastatingly hard Mai-Geri (front kicks), Yoko-Geri (side kick) and Mawashi-Geri (roundhouse kick) attacks. The ancient masters well knew the power of Isometric Training for Martial Arts and often incorporated these deep stances, held with great tension as a means of developing their incredible strength, as shown by Sensei Kanasawa opposite. I discuss this in more detail in my complete 7 week course 7 Seconds to the Perfect Body and give examples of the legendary sensei’s , such as Mas Oyma and leading exponents such as Bruce Lee who used Isometric Training to develop their staggering strength and incredible abilities. “A human life gains luster and strength only when it is polished and tempered." Nowhere is this more relevant than in the incredible intensity and strength gained by the proper application of Isometric Training. In the following articles I’ll be looking at each aspect as it relates to the overall improvement of martial arts training. Regardless of your style, tradition, build or experience, Isometric Training for Martial Arts can give you the edge needed to take your skills to the next level. You’ve been reading about Isometric Training for Martial Arts, check out the next isometric article, Isometric Training for Martial Arts Strength - here.